That characteristic chug from the Bay Area is perhaps as much of a reference point in these times as it was back in the heyday of scrotum-squeezing pants and decent METALLICA albums. Wisely, it could be argued, bands like TESTAMENT have brutalized their sound further to keep up with the seething new breed (THE HAUNTED etc.). Then you have a band like METAL CHURCH: resolutely revisionist and not what you could call a skull-smashing proposition. 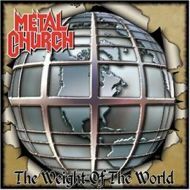 As it is, METAL CHURCH's recorded history bar the first two albums — "Metal Church" and "The Dark" — has been patchy. And "Weight Of The World" won't shatter that reputation, you would imagine, because it winds back the clock even further to the sound of the pre-thrash New Wave Of British Heavy Metal movement — which, again, probably isn't what the nu-thrash hordes are baying for. Guitars, therefore, are definitely not set to eye-watering levels of crunch on "Weight Of The World", even at its most thunderous on opener "Leave Them Behind". It always has been equally about technique and melodic sensibility for guitarist Kurt Vanderhoof, and if you're OK with more light and shade than searing menace, then a largely acoustic, strangely QUEENSRŸCHE-ian "Sunless Sky" is perfectly acceptable atmospheric metal. Also not bad for something semi-heavyweight is "Time Will Tell", which starts off all moody once more, then canters merrily along like the SCORPIONS in mid-paced riff nirvana. For a band that were once tipped — somewhat outlandishly — for the top, however, you still can't escape the feeling sometimes when closing your eyes that you're in a smoky bar listening to a pub metal band winding down at the end of the night to a bunch of disinterested drunks. Some of this can be attributed to new vocalist Ronny Munroe not exactly living up to his "Rob Halford meets Dio" tag in terms of vocal stature. In terms of songs, "Hero's Soul" shouldn't be so bland for a band with twenty-three years of service under their belts, and quite how they managed to construct an eight-minute song from the pool of average ideas that makes up "Madman's Soul"? Well, you have to appreciate the audacity, if nothing else. Strangely, all this doesn't swamp the album so much that it deserves to be instantly forgotten. If there is such a thing as half-power thrash anymore, and you don't mind the odd dip in quality, then "Weight Of The World" is a likable, if flawed, piece of work.